This is going to be the start of a new feature here on my blog, where I will show you things I love. I briefly mentioned this in one of my recent posts and got some good feedback, so decided to go ahead with it. This probably won’t be a weekly feature due to how busy I am at the minute, but I’ll try to keep it up, maybe alternating each week with my Currently Coveting posts! Anyway, “Sitting Pretty Loves” will be a place to show you anything from what I am lusting after to something I have discovered and fallen in love with. Founded by designer Katherine Trigg, Vintage Kit is ‘is an inspired collection of unique children’s clothing created for parents who want their children to still be children in our fast modern world’. Stocking beautiful dresses in pretty prints for girls, and fun t shirts and faded denims for boys, you can be sure to kit your little ones out in something adorable. I wish I had a little girl to dress up in some of the dresses from their new Disney line, but that won’t be happening any time soon! Disney by Vintage Kit is a new range featuring prints based on some of the most loved Disney films, ranging from Bambi to Cinderella. A favourite of mine is this adorable Snow White dress complete with red chiffon bow and underskirt. How cute?! The dress is an exclusive to Selfridges, and the brand is also available in selected Harvey Nichols stores. Click here for a list of stockists. The company currently has a sale on at the moment, so if you like the look of these and have a little one of your own to spoil, I’d recommend you snap something up fast! 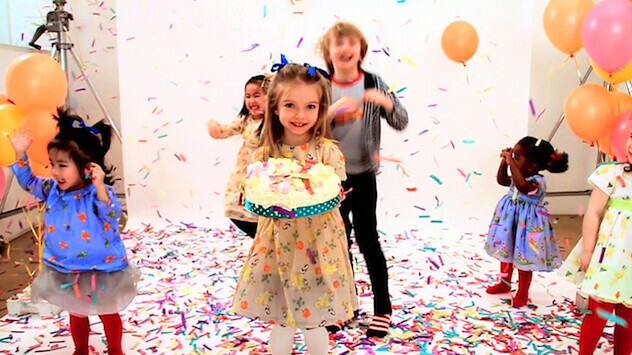 I’ll leave you with this oh-so-sweet video of their Fall collection. I challenge you not to smile! Vintage Kit Fall Collection from JAM Flicks on Vimeo. UNIQLO HEATTECH + FREE SAMPLE FOR READERS! Aw, so cute! I love how princess-y the dresses look.